Tampa, Fla.—It was standing room only last night at the St Pete Times Forum, which is formerly known as and still affectionately referred to by many purists as the Ice Palace. The party was underway…The newly renovated building was decked out and Lightning fans were anxious to welcome back the heroes of the 2010-11 season. A video tribute to the Lightning, the new pipe organ christened, the Lightning staff and full team were introduced. Ray played the organic version of the National Anthem. Before the hors d’oeuvres were served, Florida alternate captain Tomas Kopecky snapped a wrist shot from just outside the right circle that deflected off lightning defenseman Eric Brewer and the Cats from South Florida put a depression in the party just 6:15 in. The power play tally was Kopecky’s first goal of the young season. 1-0 Panthers. Later in the first, Panther Erik Gudbrason, who wanted a piece of Steve Downie Saturday night in Sunrise squared off with Ryan Malone tonight. At 6 foot 4, 195lbs, Gudbrason demonstrated long reach on both Malone and Downie. Two fights in two games? Somebody call Brendan Shanahan! Well anyway, at only 19 years-old this Gudbrason kid will grow into a force in the NHL. A power play goal, the first home goal in the newly renovated Ice Palace at 9:22 was by Teddy Purcell from Ryan Shannon and Marc-Andre Bergeron which would have the building jumping as the Lightning tie the game at one. Just after a penalty to Tomas Kopecky was expiring; good work by Nate Thompson carrying the biscuit in hard on Panthers goalie Jose Theodore lead to a scramble on the doorstep. Adam Hall pushed the loose puck back to Victor Hedman at the mid-point and the big defenseman did not waste it. Lightning get the lead at 14 minutes even. The one goal lead would not last for long as another Panther alternate captain, Stephan Weiss, scored a power play goal 3:12 seconds later. Game tied at two, and the first twenty minutes would end that way. Then once again little did know this would be the door slamming shut. Former Rocket Sports & Entertainment Thor Line member Sean Bergenheim netted his first goal of the season, an unassisted shorty. (Bergenheim doubled his sweater number from #10 to #20, kind of like his bank account.) It was sloppy power play blue line play by Marc-Andre Bergeron that allowed Bergenheim to scoop up the loose puck and break-away all alone easily beating Lightning net-minder Dwayne Roloson. Captains need to step up when their team is down and that’s exactly what Vinny Lecavalier did. Lecavalier took a pass off the boards from that point getting machine Marc-Andre Bergeron, (8 points on the season) maneuvered around a broken stick with a Panther defender all over him and effortlessly flipped the puck top shelf over Theodore. Lightning close the Panther lead back to one at 4-3. 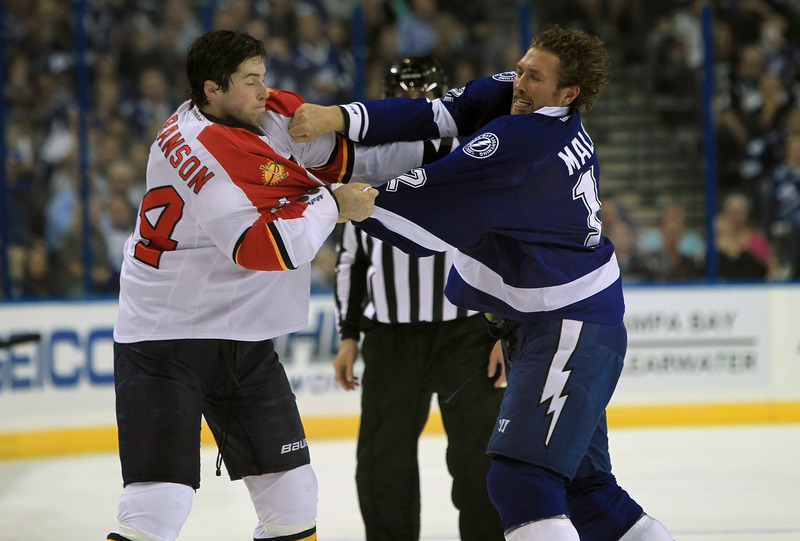 The 2nd period would end with the Lightning being short-handed as Dominic Moore was in the sin-bin for slashing. The 3rd opened and the Lightning killed off the: 21 left in Moore’s sentence. Later in the stanza Panther RW Kris Versteeg would net his second goal of the night from Tomas Fleischmann and Weiss giving the Panthers a two goal lead at 5-3. What a cross ice pass by Matt Gilroy which Steven Stamkos one-timed it past Theodore. Stamkos pointed immediately to Gilroy in appreciation. Bergeron would pick up the secondary helper. It was the second time tonight the defense pair (Gilroy and Bergeron) assisted on a goal, the other was the Lecavalier goal. With scoreboard lighting 5-4 Florida; life came back to the 19,204 sellout crowd. The Panthers would say enough is enough and close the party down with two goals in 1:19 compliments of Weiss and late party arrival defenseman Jason Garrison. Florida Panthers 7, Tampa Bay Lightning 4. With 1:36 left to go in the game Florida flipped a soft one in on Roloson which he gloved and held. What was left of the 19,204 gave out a Bronx cheer. And with Paul Porter’s announcement of one minute remaining in the period, another Bronx cheer. That’s two Bronx cheers in: 36 in case you are scoring. The Lightning hosts the NY Islanders Thursday night and continue their New York State of opponent as the Buffalo Sabres visit downtown Tampa. Saturday night. Get the Party Started at Lagerheadz!